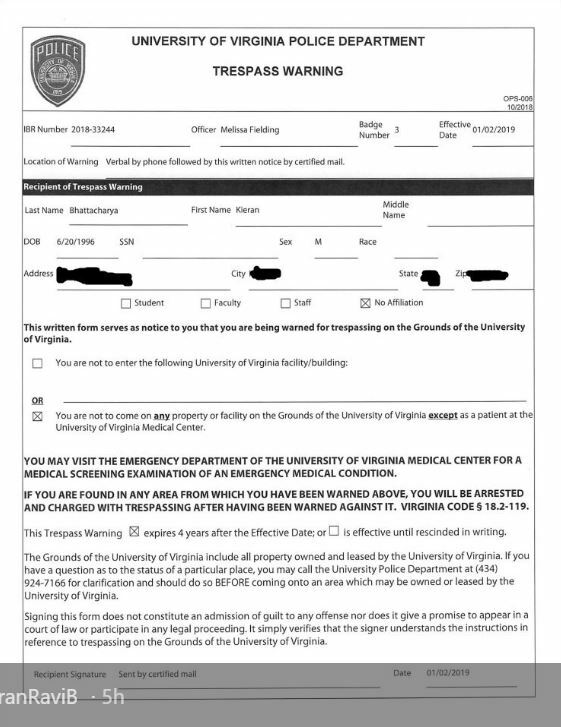 the LATEST news in the case is that University of Virginia had the police issue a 4 year no-trespass warning against Kieran, and are thus refusing to process his appeal. This is literally insane, the SJW communists kick you out and then have the police ban you from even stepping foot onto campus so you can appeal. The fact that the media refuses to cover this story is proof that the media, educational system, and government are all in cahoots with each other. This story could cause real damage to their TRILLION dollar student loan debt scam. There's also the fact that there have been a massive number of shills trying to bury this story. Well, they can't censor the f***ing internet, so we WILL make it go viral on the internet and MILLIONS of young people WILL see this story and it will show them the true nature of our colleges, that our colleges are run by a bunch of radical communist SJW scum. The internet is the future, you scums. The truth is coming out whether you want it to or not. He sounds like a lawyer. Maybe he violated social norms by acting like a law school student in a med school. A few business school students may debate like that, but he may be a bit too intense for some business schools. I doubt they'd have kicked him out though. It's pretty obvious the doctors there are laid back and sociable. He's a debater. If he'd been a bit more humble about it, and just asked them what the problem was and it might have gone well. It sounds like they are kicking him out for debating. He went in there and took control of everyone and wanted to document everything legally. One thing some business people will tell you is a sure way to get into legal trouble is to follow your lawyers advice...in some cases. They give you advice that is good for a legal perspective, but it can be really bad from the perspective of making an employee, supplier, etc. angry enough to sue you. This guy was probably trying to cover his behind legally, but in the process sealing his fate. If he'd gone in there as the humble student and let them tell him what they expected and said he'd jump through their hoops, he might be in med school. I can see his point about not wanting to give out private medical information to university doctors. He might have a legal case there. I dont' know. It could be new legal territory. He could have also played the race-culture card. His behavior seems typical to me of some Indian academics. Some Indians are debaters. If he'd pointed that out, and said in spite of his accent, he was still Indian, and it was a part of his culture to debate and take people to task over weak points in a presentation as part of the academic learning experience, then he could have subtly painted them as racists if they kicked him out. Or he could have been blatant, and offensive about it, and said the panel of white people were talking about kicking out the type of black student who did not have a social protections against racism afforded to African Americans. Dude, the kid is only 22 years old. So he's a bit hot-headed. We were all a bit hot-headed when we were his age. The difference is, back then, we wouldn't get our lives destroyed for being hot-headed. How can you possibly take the side of the SJWs? f**k your "morals". NEVER side with your enemy. It's time to stop this retarded boomer idea of "having the moral high ground". You seem to have tunnel vision. I do not assume that he was being kicked out for disagreeing with the snowflake ideology, but for disagreeing and holding to his point in public in a way that embarrassed the people promoting the weak theory. There were apparently some sorts of interactions between himself and others that led up to the faculty meeting. He also wasn't jumping through their hoops to go through a psych eval, so they kicked him out. It could be that he was not 'nice' and 'cordial' enough for them. I may be wrong. It could be his opposition to microagressions that got him kicked out. But it could also be that his tendency to debate went against their med school culture. And he could have been rude to someone before that meeting. I did not know that he was 22. That is a young age to go through such an experience. I think if I were on the committee, I would have voted for him to stay. But their policy might have forced them to stick with the psych evaluation as a requirement since someone in the administration had requested it. They could have kicked him out for not getting the evaluation. Do you have any information to support the idea that this was not the case. It's possible they kicked him out because he wasn't a left-winger, but that seems unlikely. Many universities are run by left-wing radicals. You could have a point if you were arguing about the soft fluffy no confrontation method of education they may be expecting. Have you ever worked as a faculty at a university? Do do that, and then we can talk about this. How are you even disagreeing with my statements? Yes, he was kicked out because he dared to speak against the SJW cult beliefs. The fact that you are taking the side of the SJW communist scum over one of /ourguys/ is proof you are a weak, pathetic cuck and cannot be saved. This is why the West needs to collapse. It got published to PJ Media, a relatively large alt-right media blog news sites. Only an hour old and it has 90 comments so far. If he is Indian then he is not really one of /ourguys/ and probably shouldn't have been there. He's an American and a hapa, a half indian half white. Are you the half-Indian dude in the video? If not, how do you know what he said to administrators between his confonting the professor's microaggression philosophy and his hearing? That's what they said was one of the reasons they were meeting with him. They could have a culture where you do not question professors (poor for education admittedly), and they could have their own culture as far as socialability that he does not conform to. Sure, it could be because he did not believe in microagressions. It could also be they kicked him out, as they implied, because he was confrontational. They may have wanted him to just be a humble student, listen, jump through their hoops, and they might have kept in him no matter what his politics. Looks like a lot of those posters agree with me. It could be they don't like the fact that he challenged her left-wing theories. I did not hear him cross a line, IMO, in that Q&A session, but he might have afterwards in interactions with faculty. He had not gotten the psych evaluation they required of him apparently, at the time of his hearing. Looks like a lot of those posters agree with me. Most of the responses seem more mature than some of the responses on here. and now the story has been buried. Remember guys, even the "conservative media" is controlled by (((you know who))) and (((they))) aren't going to publish any story, even if it supports their conservative "values" if it threatens any part of (((their system))). In this case the story was a threat to the TRILLION DOLLAR student loan debt scam bubble. Like much of what SJWs say and do it is the reverse. They almost always project. And the aggressors are in actual actions the SJWs. What SJWs are doing is essentially is requiring him to pass their religous test, if you do not profess belief in the SJW religon and agree with its perscribed dogmas you are branded a heritic, punished and purged. If he was suffecently repentant and groveled to the SJW inquisitors he would have been spared. The flaw in this is the SJWs will up the intolerance and SJW religous test will become a condition of enrolment. and the youtube video in that article got 1000 likes and 230 comments. Could some White men have it even worse than Asian men?